Restaurant pagers are not only available to page waiting guests but are also available to help servers to expedite orders. 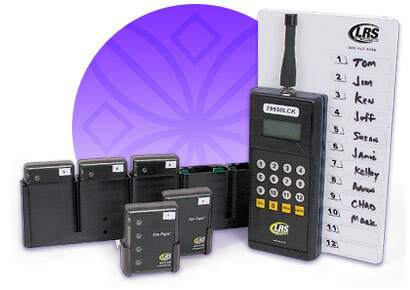 Long Range Systems restaurant server pagers, beepers, and buzzers can be called from the kitchen transmitter as well as from the transmitter at the host stand - if you are using guest pagers in your restaurant. 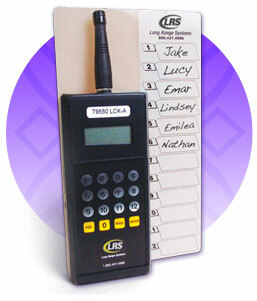 LRS server pagers for restaurants offer on-site programming. If a pager becomes lost or broken, you can reprogram another pager from your transmitter. You do not need white boards or grease pencils because now your pager is the same as your ID. The chef knows the number to page because it will be printed on the ticket as the server ID. Server pagers, beepers, and buzzers will increase sales and improve service with the following benefits. 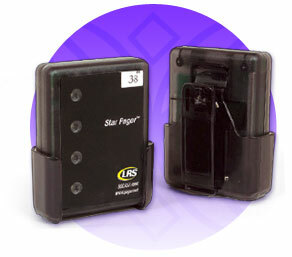 If you are looking for a low-cost server paging solution, look no further. This UHF transmitter can page up to 12 servers with the push of a button. It also has a built-in dry-erase board. Being rechargeable is the real benefit of this unit allowing it to easily be moved to a convenient location without the requirement for an electrical outlet. Leaving it plugged in will not hurt it either. This is ideal for your kitchens, bars, etc. You can use multiple T9550LCK transmitters if you wish to page servers from different locations throughout your restaurant. Wireless programmability allows facilities to renumber pagers on site. Rechargeable transmitter allows for freedom of movement. The all-page feature can notify staff simultaneously. Range test mode shows you the operating range of the pager. 1, 2 or 3 vibrations can signal server where to go.